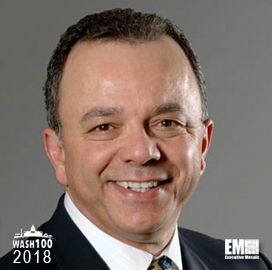 Executive Mosaic is honored to introduce Noblis President and CEO Amr ElSawy, as an inductee into the 2018 edition of the Wash100 — Executive Mosaic’s annual selection of influential leaders in the government contracting arena — for his contributions and leadership in the science and technology community. ElSawy assumed leadership of the Reston, Virginia-based nonprofit science and technology organization in 2007 and also serves on Noblis’ board of trustees. Noblis’ ESI subsidiary opened a new office in Warner Robins, Georgia near the Robins Air Force Base in October 2017 to provide support to its customers in the U.S. Air Force. “We look forward to sharing an environment where our employees are excited to focus on supporting critical Air Force command, control, communications, computers, intelligence, surveillance and reconnaissance; cyber; and space missions,” ElSawy said at the time. The nonprofit also moved from its location in Falls Church, Virginia to a new headquarters in Reston in January 2017. ElSawy noted that the relocation reflects Noblis’ commitment to facilitating collaboration among its employees, partners and customers. Under ElSawy’s leadership, Noblis was named one of the Washington Post’s Top Employers; included in the list of “50 Best Small and Mid-size Companies to Work for in America” and selected by the Ethisphere Institute as one of the “World’s Most Ethical” companies. Noblis sold its RASMAS subsidiary to information technology company Inmar in December 2017. The Noblis CEO said in an interview with ExecutiveBiz in August 2017 that the nonprofit sees business opportunities across the civil, intelligence and defense sectors in areas such as cyber, analytics, high-performance computing, sustainability, biosciences and telecommunications. ElSawy added that machine learning technologies will have the biggest positive impact on the federal government in the next five years through the use of advanced analytics to address challenges. Executive Mosaic congratulates Amr ElSawy and the Noblis team for their selection to receive this award. Click here to view the full list of leaders recognized in the Wash100. Sign in to cast your vote for those executives with the greatest impact on government contracting. This year represents our fifth annual Wash100 award selection. The Wash100 is the premier group of private and public sector leaders selected by Executive Mosaic’s organizational and editorial leadership as the most influential leaders in the GovCon sector. These leaders demonstrate skills in leadership, innovation, reliability, achievement, and vision.